Individuals employed in the logistics industry are directly responsible for the transportation and handling of valuable goods and information, and thus reliability and trustworthiness are key factors in selecting employees. Their fast-paced businesses require reliable information quickly, and reporting capabilities that take into consideration their unique organization. 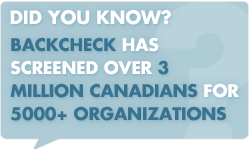 Choose BackCheck, and we will leverage our depth of experience in serving the logistics industry to deliver fast, reliable background check information.